We are currently engaged in an international collaborative project to implement and evaluate Professional Development (PD) to promote Inquiry-Based Learning (IBL) in mathematics and science. The rationale for the PD programme is underpinned by claims that IBL, through the use of digital technology and dialogic group work, can engage and motivate students. We are also aware that PD is not always successful in transforming teacher practice, and a key aim of our study is to determine the challenges and opportunities generated by the PD. 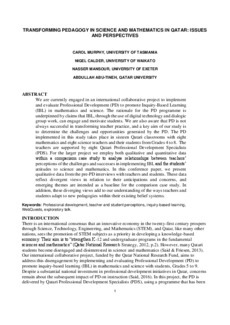 The PD implemented in this study takes place in sixteen Qatari classrooms with eight mathematics and eight science teachers and their students from Grades 4 to 8. The teachers are supported by eight Qatari Professional Development Specialists (PDS). For the larger project we employ both qualitative and quantitative data within a comparison case study to analyse relationships between teachers’ perceptions of the challenges and successes in implementing IBL and the students’ attitudes to science and mathematics. In this conference paper, we present qualitative data from the pre-PD interviews with teachers and students. These data reflect divergent views in relation to their anticipations and concerns, and emerging themes are intended as a baseline for the comparison case study. In addition, these diverging views add to our understanding of the ways teachers and students adapt to new pedagogies within their existing belief systems.